Despite rumours or residence, reported in many local guidebooks over the years, Darnley's House actually has nothing whatever to do with Henry, Lord Darnley – second husband to Mary, Queen of Scots, and father to James VI (I). It can't have. It wasn’t built until decades after he was murdered by the Earl of Bothwell (soon to be Mary’s THIRD husband) at Kirk o' Field, outside Edinburgh, in 1567. Nor were the upstairs floors a 'nursery' for young King Jamie, as the plaque on the second-floor wall proclaims - as the upper levels were replaced during extensive renovation in the 1920s. That said, was occasionally said to visit the building which used to stand immediately behind this spot, for which the current chambers of the Coffee House were once the stables. 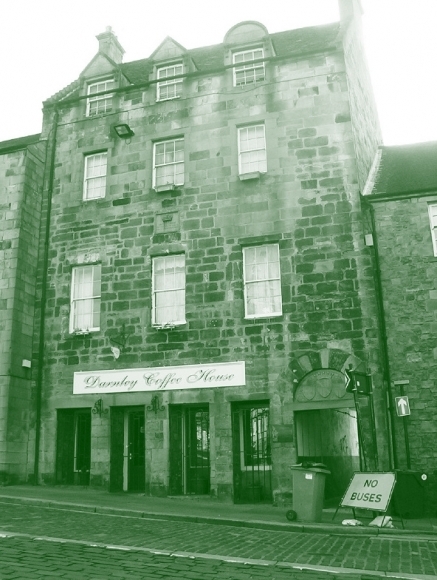 That the aforementioned residence was the Old Town's most notorious 'Bawdy Hoose' - a brothel – may possibly explain the poltergeist activity reported here over the years. After all, ‘things that go bump in the night’ are nothing new to this fine cafe!